A small data logger/locator for model rocketry. Three CAN transcievers and a microph^WBLE module. A breakout board for the ESP8266 which has the same form factor as the SparkFun WRL-12072 CC3300 breakout board. Both serial and SPI connectivity is supported through the use of an SC16IS750 SPI-to-UART. iPhone 4/4S displays are high resolution LCDs that are inexpensive and plentiful on eBay. This project describes a breakout board and related logic to talk to them using Altera FPGAs. 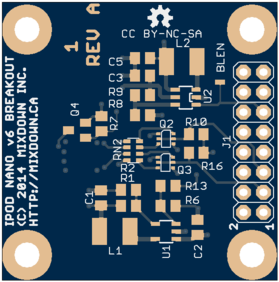 A project which summarizes and continues on from the excellent Mike’s Electric Stuff blog, where he details the reverse engineering and development of a MIPI DSI video generator for the iPod Nano v6 LCD.